A small initiative to help, spread and increase the awareness of Information Security through learning, sharing and collaborating with each other. This initiative is highly inspired by #100DaysOfCode which has reached more audience and helped folks meet their goal. Considering the large volumes of data breaches and security incidents that are happening across the world, it is highly imperative that we collectively put in our mind, thoughts and action to reduce such incidents in the future. Start reading/researching on a subject or an issue or pain point you have met in real life. Focus on finding ways of improving the defenses against it. Find the methods, tools, techniques, processes to enable us to fight the issue with full force. Try implementing the same in your environment be it home or office. Share your experience, debate on the subject & give in your feedback. The more we focus on common day-to-day issues, the more it will benefit us all. In case if you have a special skill or knowledge on handling a specific problem, feel free to guide us on the resources and methods that can be used by all of us. I strongly believe that every single such action will benefit numerous people for sure. Simple steps yet produces excellent results. Nothing new, nothing different yet through a community action the same information/comment/suggestion/feedback can reach a larger audience better. As a community of regular internet users, software developers, IT, SysAdmin, Security Specialists, GRC and Auditors, we do have the potential to change this to help all. Suggestions or ideas on improving various aspects of information security can be shared across for the benefit of all. These suggestions can be in the form of a tweet, facebook post, blog post,GitHub code,CTF challenges, articles etc. Primary reason for initiating this is to help folks who can benefit from the collective knowledge and wisdom of each one of us. As a community we have a responsibility to support and give back to the community that is helping us from a professional angle. A safe internet without the regular hassles and worries of data theft and other high impact issues will be a good benefit to all. Yes, this is a very high ambition, however every achievement starts only with a simple first step. Let us take that step today! Let us spend few minutes every day for the next 100 days and support each other. Basic idea is to help and support each other through sharing knowledge and wisdom gained by experience and learning. Every day let us re-visit problems in information security and focus on that specifically. Let us share our ideas on those problem elements and benefit from this collective problem solving challenge. Learn or Share solutions/suggestions for solving Information Security Issues. Tweet your progress every day with the #100DaysOfSecurity hashtag. 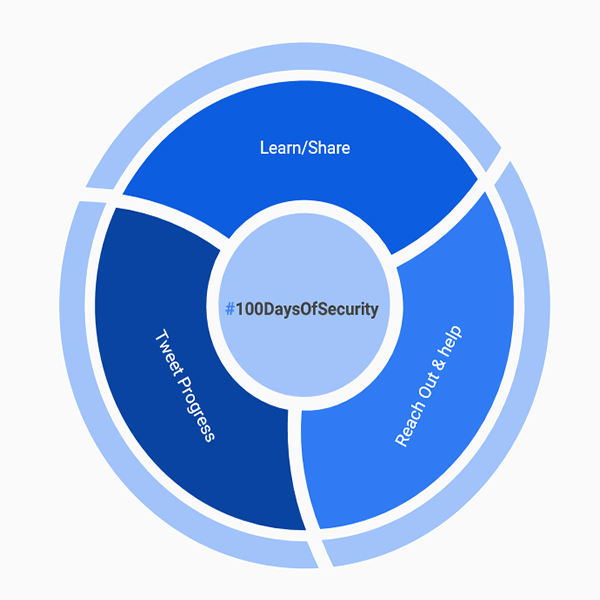 Please adhere to #100DaysOfSecurity community rules and make sure our posts are tweeted with the hash tag #100DaysOfSecurity for everyone to follow. This will help in getting more visibility to the posts thereby benefiting all as a community. Feel free to give in your inputs/suggestions down below for all. Stay Safe, Stay Secure & Support Each other !